On November 19, the Assembly of the First Nations of Quebec and Labrador (AFNQL) passed a resolution brought forward by Algonquin chiefs to protect the sacred Akikodjiwan falls site on the Ottawa River (Kichizibi) in downtown Ottawa/Gatineau, Canada’s capital, unceded Algonquin territory. 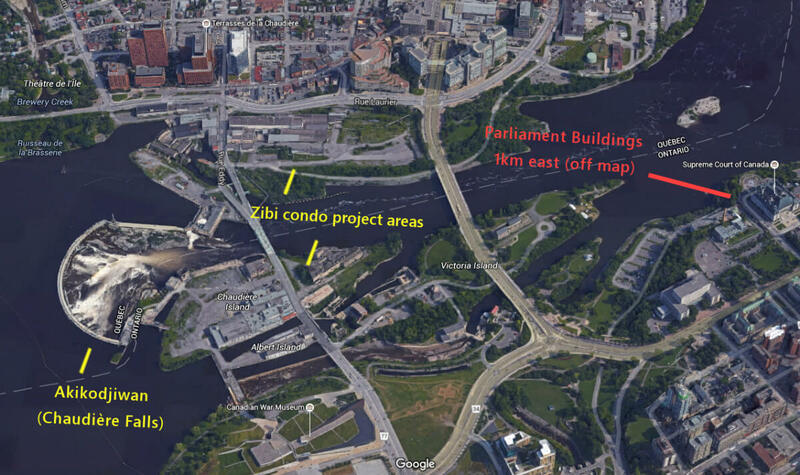 This is in opposition to Windmill Development Group Ltd’s plans, in partnership with Dream Corp, to build a commercial and condominium development named “Zibi” (an Algonquin word meaning “river”) on two of the islands at Chaudière Falls and along the Gatineau-side shoreline. Hydro Ottawa has also recently started development on a new hydroelectric generating facility at the dammed falls. The prelude to the points of the resolution cites articles 11 and 12 of the United Nations Declaration on the Rights of Indigenous Peoples, the historic Algonquin habitation and use of this territory, and the destructive history of colonization. It asserts the Indigenous rights of the Algonquin Nation to this site and condemns the violation of Canadian law and the international human rights of the Algonquin Peoples by different levels of government. The AFNQL resolution was passed two days after the provincial Ontario Municipal Board (OMB) dismissed appeals against the City of Ottawa’s decision from last October to rezone the island lands for the “Zibi” development. The rezoning is a prerequisite for the sale and transfer of these lands from the current holders, Domtar Corp, to Windmill. A minority of the land slated for the development is owned and leased out by Public Works Canada/the National Capital Commission. The OMB decision is being challenged at the Ontario Divisional Court by one of the original appellants, renowned Anishinabe architect Douglas Cardinal. Cardinal is a keeper of the late Algonquin hereditary chief and elder William Commanda’s Asinabka vision for the waterfalls and islands, and has played a leading role in the opposition to the Windmill development. The chief of Wolf Lake First Nation, Harry St. Denis, brought forward the AFNQL resolution, and it was seconded by Jean-Guy Whiteduck, chief of Kitigan Zibi Anishinabeg First Nation. The resolution was passed unanimously (with one abstention) at last week’s meeting of the AFNQL, a 43-member organization including nine Algonquin chiefs. Although not all of the Algonquin chiefs were present for the resolution’s passing, Chief St. Denis confirmed for this article that he had ensured they were all supportive before he brought the resolution forward. The only federally recognized Algonquin chief to support the development is Kirby Whiteduck of the Algonquins of Pikwakanagan First Nation (located by Golden Lake, Ontario). The organization Algonquins of Ontario (AOO) is also on record in support of the development — the AOO was formed in 2006 to negotiate the eastern Ontario Algonquin land claim that in current form would give up rights to the Ottawa islands section of the sacred site (along with some 98.7 per cent of the full territory being negotiated in the claim). Seven of the 16 votes in AOO decision-making are held by the Pikwakanagan chief and council, with the other votes coming from the Algonquin Negotiation Representatives for each of the nine non-status Algonquin communities included in the land claim process. Greg Macdougall does interdependent/freelance media, grassroots education and community organizing/activism based in Ottawa, unceded Algonquin territory. This article was originally published on his website EquitableEducation.ca and is reprinted here with permission.